Three days left and then its on! The spookiest Saturday of the year, with the worst sugar hangover known to mankind. Halloween is coming... And we are not quite ready! There is still so much to do and the kid still hasn't picked out the final costume. My favorite kids in their comfiest Halloween outfits. All from Shampoodle, Lindex and HM's various spooky halloween-collections. But prepping is in full force and this year we are turning the kid's birthday party into a Halloween bash for toddlers. We're decking the house with creepy crawly spiders, skeletons and pumpkin heads and bringing out all sorts of fun and spooky games. But this also means three Halloween costumes. One for the party, one for the actual trick or treating and one for the yearly Ghost-party at his preschool. 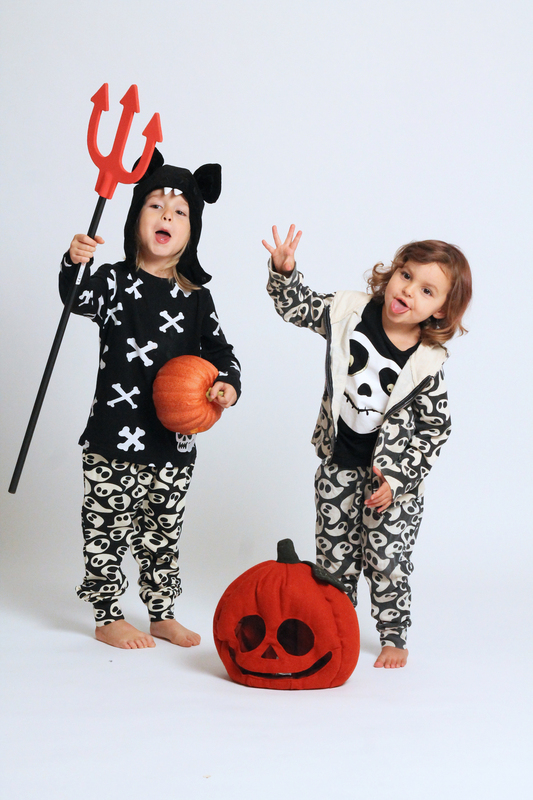 I think we will go the comfy road at the preschool party and what could be better than our favorite spooky joggers from Shampoodle. The bat-hat from H&M's All for children-collection is also a fun (and not so scary) favorite and the big chains like Lindex and Zara have all come up with fun Halloween themed shirts that can be worn even after the holiday is over. I fell for this long sleeved Crossbones tee from Lindex. It's stretchy and soft and made from organic cotton. Naya grew into Willems spooky joggers from last year and the Nightmare before Christmas tee from H&M is still a favorite in our house. Plus, how can you not love the pumpkin head from 2012's All for children collection? 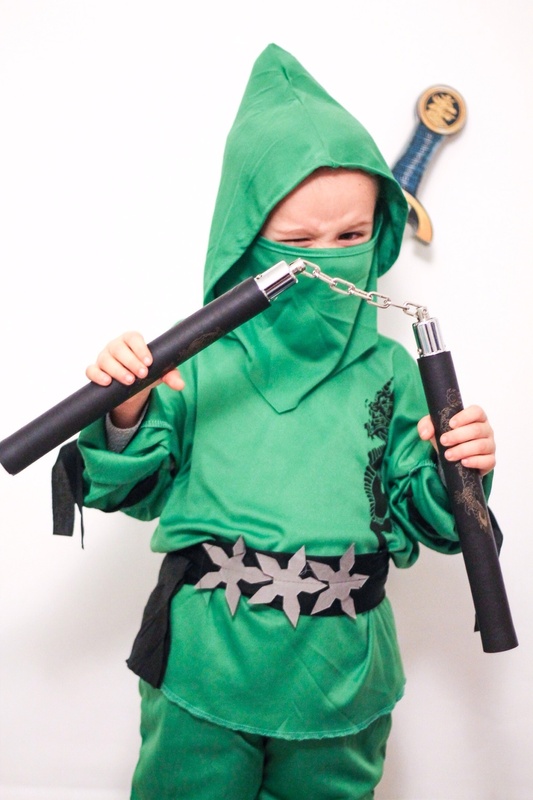 For the Halloween birthday party, the kid wants to be the green ninja - Loyd - from Ninjago. Surprisingly this is not a costume that can be store bought, at least not in Sweden. There are 6.8 million versions of Elsa's dress from Frost but finding a Ninjago costume (without ordering it from Ebay) has proven really difficult. 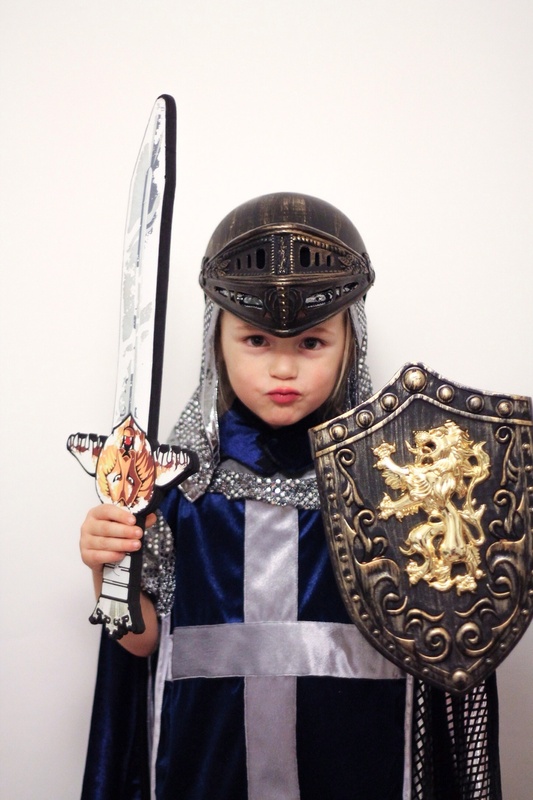 This version in green from the local toy store is what I've come up with so far and the photo of it is about the same crappy quality as the costume itself, but the kid is soooo happy. The green ninja is his ultimate idol. The kid is crazy about ninjas. For real. I wish I was better at sewing - then I'd make him a really cool Ninjago getup. Oh, and for those of you wondering; the nunchuks are soft foam so no worries. For the annual Trick or Treat in our neighborhood its a toss between three options; A knight, a vampire or - if I get to decide - a crazy scientist. The problem is that I rarely get to decide anything these days. Below you'll find a bunch of photos from our playtime in the studio last week. Halloween was a fun theme for the kids.